Hizir Aga, a foreman of Fatih Sultan Mehmet period, had this mosque built which is located in Balat, on Mescid Street in the Ouarter of Hizir Cavus. Very first construction date of the mosque is not known. 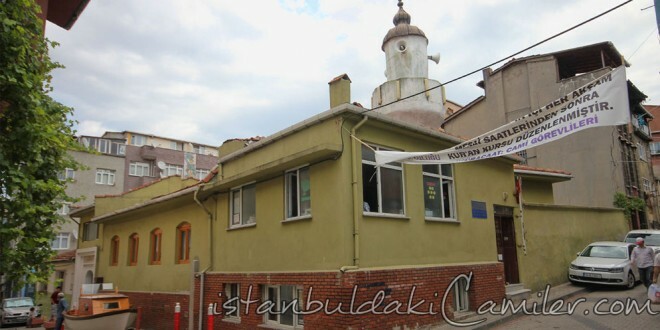 It burnt together with its adjacent school in the great fire of Balat in 1854 and later on an anonymous benefactor had the masjid rebuilt in the name of Hizir Cavus. It has an oblong design roof and it is made of bricks and stones. Inner wall skirts are decorated with faience whereas the upper parts are covered with timber. Its ceiling is of concrete yet the dais and the minbar are of wood. The mihrab is surrounded with marble blocks however the inner part is decorated with faience. It has got the sections of muezzin, ladies’ and last congregation. Its minaret, located on the right the mosque, is made of bricks which are plastered with cement. The two graves and the grave with Hizir Cavus epitaph dated 1453 are covered with two iron bars. With the help of beneficent people, the Association of Monuments had the mosque repaired by elevating it a metre in 1963-64.